Lighting Replacement Lampshade made for use with Ceiling Fan, Chandelier or Wall Sconce Light Fixture. 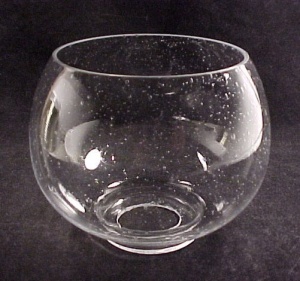 Clear glass, small bubbles in the glass, Ground Rim, Neckless saw cut fitter rim with no lip. Flare: 4 1/2 inches W.
Fitter Opening: 1 3/4 inches W.
Attaches with a Shade ring (Not Included) which screws onto a threaded light socket. Gently Used. No chips or cracks. Possible minuscule signs of use, quite nice.